Rob Phillips fell in love with documentary films at NC State. It happened about 10 years ago, when Phillips enrolled in the university’s graduate program in English. He initially concentrated his studies in literature, but switched to film studies after taking just one film class with former professor Joe Gomez. “Everything kind of exploded in my mind,” Phillips says. “It made me re-think traditional texts, and helped me explore the ways you can study movies as texts. Alumnus Rob Phillips on Education Matters, a local TV program created by the Public School Forum of North Carolina. As an English teacher at Leesville High in Raleigh, Phillips has applied what he learned from the master’s program and even co-wrote a new curriculum for cultural media literacy at his school. In recent years, he’s taken his affair with film a step further by co-directing his own documentary, Teacher of the Year. The film, which explores the complexities of teaching in the 21st century, has grown from a local crowdfunded project to a full-fledged documentary that’s being screened at notable film festivals. It’s also caught the attention of local and national media outlets (The Atlantic featured the film earlier this year). Phillips and the film’s co-director, Jay Korreck, also partnered with the National Humanities Center to host two recent film streamings and webinars on themes of humanities education. In many ways, Phillips says the documentary grew out of his studies in grad school. At NC State, he focused heavily on how media shapes personal identity — who we are and how we see ourselves. Teacher of the Year was borne out of that same idea, Phillips says, when he started looking at how teachers are portrayed in the media. Phillips started his research by contacting and interviewing scholars who could lend their expertise to the film. Things really took off when the filmmakers started following Angie Scioli, a Leesville High teacher who founded a statewide teacher advocacy movement. Scioli’s story became the backbone of the film, which documents how she juggles being a successful teacher, activist, mother and wife. The filmmakers started a crowdfunding campaign and earned a grant from The NEA Foundation with support from the North Carolina Association of Educators and Public Schools First NC. The finished documentary premiered earlier this year at the Teachers, Teaching, and Media Conference at Wake Forest University. 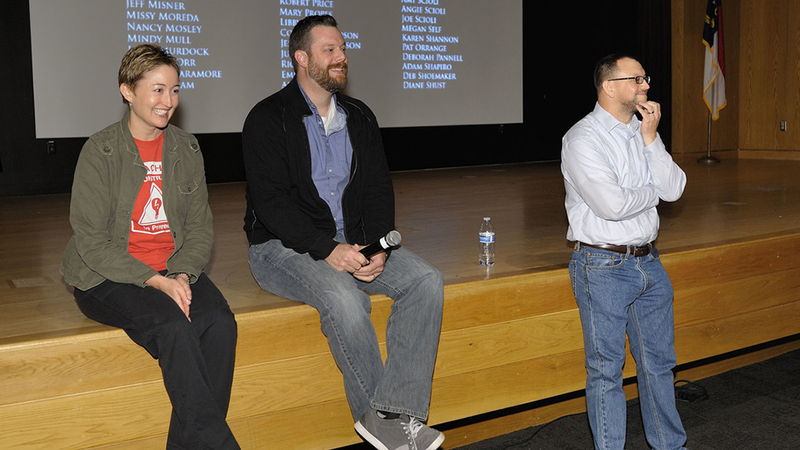 For more information on the film and future screenings, visit teacheroftheyearfilm.com.